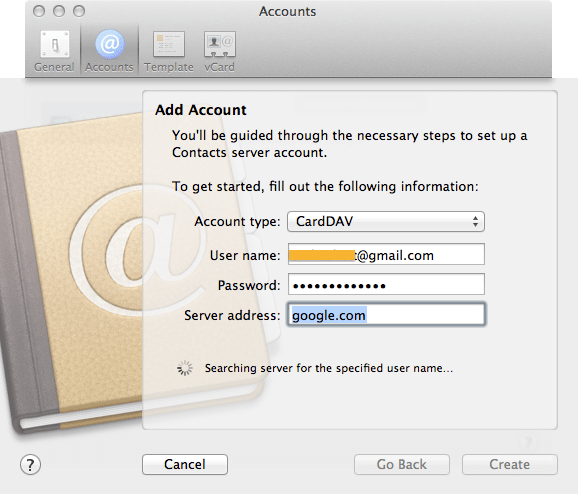 Google recently enabled CardDAV syncing with Google Contacts, and has a nice support document on how to set this up with an iOS device. 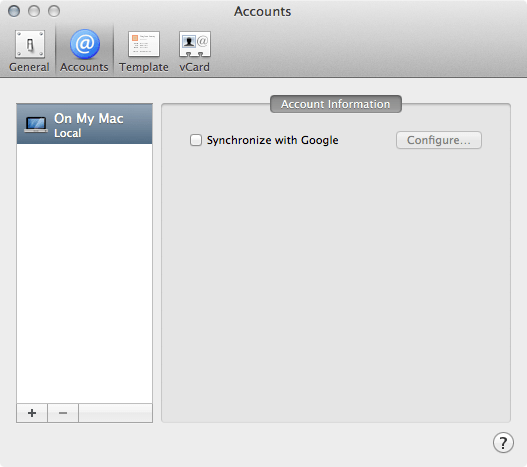 While this is quite easy to configure (and works really well in my experience), the same thing can be done on the Mac, bringing your Google contacts to your computer. Update: Here’s how you can set this up on iOS devices. There are several different ways to add a Google Contacts to Contacts.app, but I’ve found this to the most reliable. Contacts.app will then ask if you want use these credentials for other types of information. Select what you wish and press the “Create” button again. By default, the application defaults to saving vCards locally on the Mac, which means information added from other programs won’t end up in the Google cloud. By using CardDAV, IMAP and CalDAV, I now have my Google-based information on my Mac and iPad mini, always in-sync. With Google dropping ActiveSync support for new users in early 2013, this is totally the way to go.